Whatever your occasion from business lunches, birthdays or weddings, Chef Peking offers elegant surroundings to spend time enjoying food. The restaurant seats approximately 160 people with various table sizes to accommodate large and small parties, suitable for all functions! To make a reservation please call us on 01582 769 358 or book online. For more details please visit our contact page. 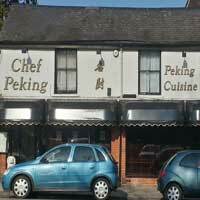 We look forward to seeing you soon at the Chef Peking restaurant.